In this Entertainment category, the competitions below may include prizes such as CDs and more. 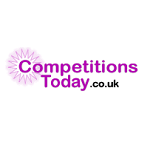 The free competitions we've listed below all provide you with winning chances and we wish you the best of luck if you enter. Hopefully you can be our next Entertainment competition winner!